Yesterday, I had many a discussion with my associate about what clients can do at home. You see he is more conservative..similar to most of my colleagues. He is of the belief that most clients aren’t capable of giving their pets adequate care at home. He doesn’t think that clients can examine their pets properly or come up with a diagnosis. There should be no at home treatment. Well I respectfully disagree..and I told him so. As to the veterinary association..they are of course not supportive of what I am doing, but I am not “breaking any laws” so I intend to keep doing it. I’ll deal with my association again if they go after me again. I pointed out how we see many sick pets that could have been treated earlier if their owners had basic knowledge. A dog ( Ginger) with a severe ear infection yesterday. The ear infection didn’t just show up…it became a big problem after a week of leaving it. If Ginger’s owner had used my vinegar/water cleansing solution regularly, then the ear infection would not likely be so big. Then if the same owner had read my book, he would have realized that the ear infection is secondary to a food allergy. He could have changed his dog’s diet- stopping the allergen causing beef and dairy products. Ginger would be overall much healthier. P.S. It’s still not too late to register for my “Win one of 3 Fr#ee Complete Home Study Courses Teleseminar” on Thursday Jan 18th at 6pm Pacific. 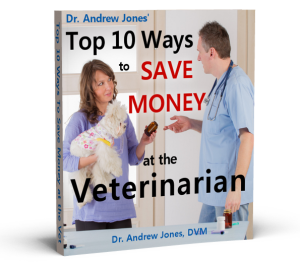 examining, diagnosing and treating your pet with my Complete Home Study Course.